February was a great month for us! We are very honored to have been featured in many different publications and want to share them with you. Amy and Scott’s beautiful I’on Creek Club wedding was given 4 pages in the most recent issue of Charleston Weddings Magazine. You can pick up a copy at most any local store selling magazines and you’ll find us scattered throughout many other pages. It really looks amazing. 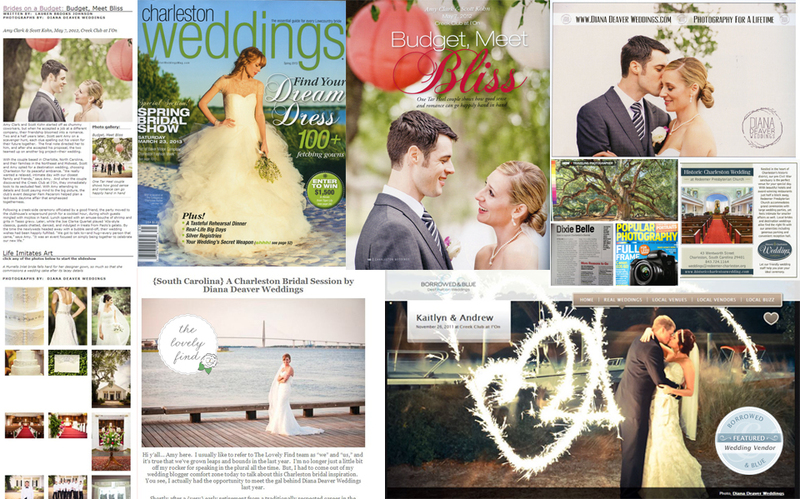 Charleston Weddings also featured the wedding in this web post. On another post Charleston Weddings featured the great work a cake decorator did matching Ashley’s cake details to her dress. You can read about that here. Borrowed and Blue featured Kaitlyn and Andrew’s Wedding. Just days after getting married Andrew was deployed! They also featured Keesha and Rob’s engagement session in which they were literally KISSING in a tree. The Lovely Find featured Kristine’s downtown Charleston bridal session. Steven had a photo featured and was interviewed for an article about photographing Charleston in the most recent issue of Popular Photography Magazine. Pick up a copy to read about it.